Welcome to Fairhaven, a seemingly normal Massachusetts small town, where the people are pleasant and the weather is good. But there’s something dark there, a neighborhood where supernatural horrors, taken root years ago, refuse to leave. Three households are in the constant grip of a terror, and can’t seem to escape it. Not that they’d want to, of course. The subjects of this documentary, directed by Michael Stephenson of Best Worst Movie fame, are utter Halloween obsessives. Victor Bariteau, Manny Souza, and Matthew and Richard Brodeur spend all year preparing for this one night. They accrue all manner of odd objects and work around the clock during October in the service of one goal: putting together the best haunted houses that they can. They are hobbyists of the highest order; no one pays them a dime for doing this. They act purely out of love for the spirit of Halloween. Victor kicked off the haunting craze over ten years ago, as his formerly routine decorations morphed into increasingly elaborate setups with each passing Halloween. Manny and the father-son team of Richard and Matt later followed his lead. Come time for trick-or-treating, their houses are among the most popular destinations in the town, as hundreds if not thousands of people pour in to get a good old-fashioned thrill from having people in costumes and mechanical monsters jump out at them. This isn’t a phenomenon restricted to Fairhaven. Rather, Stephenson uses these three houses to examine the trend of “house haunting,” do-it-yourself haunted house construction. It’s a growing industry, fueled by the sharing power of the Internet, which allows scare enthusiasts all over to compare and contrast their own efforts with those of others. The results can be quite impressive. Victor, who’s by far the most dedicated and passionate of the subjects, puts together some truly professional-quality contraptions. But even Matthew and Richard’s comparatively cheap efforts are still endearing, thanks to the obvious passion they put into it. House haunting is a realm as yet mostly untapped by corporate corruption, still dominated by independent efforts. So what kind of person makes a passionate house haunter? Victor is an office drone who finds his joy in his family and his hobby. His wife and daughters, especially the older one, support him in his efforts, even though they all wish they could live in a bigger place, one less crammed with random doodads. Manny is a blue-collar worker who sees it as a way to give people something to remember him by. Matt and Richard just want to have a good time. If there’s a common element to their shared love, it seems to be that they all missed out on the joys of Halloween as kids, and are now trying to make up for lost time. This is a wonderfully warm and funny film. While Stephenson never ever takes the low road and try to mock these people, he does recognize that there’s humor inherent in what they do. Little absurdities like a father asking his daughter to fetch a pair of eyeballs, or two men trying and failing to properly set zombie babies on a teeter-totter, make sure that no one treats the subject with any undue seriousness. But at the same time, people find genuine joy in house haunting, and the doc makes us feel it as well. 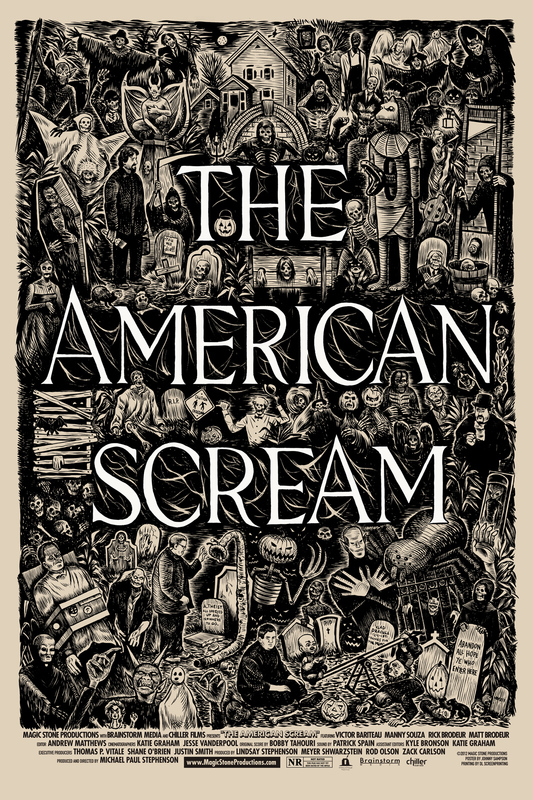 The American Scream is about perseverance, and when that patience pays off, it’s a beautiful thing to behold. It tackles an admittedly slim subject, but this doc never overstays its welcome, and is often quite pretty to look at, to boot. While Halloween season is usually the time of gory, unpleasant movies, it’s really all about pleasant fun, and this film captures that sense of good nature extremely well. 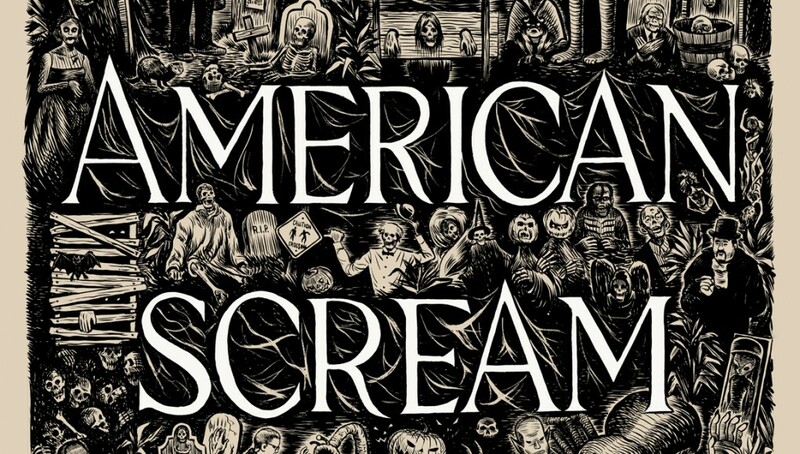 The American Scream premieres Sunday, October 28th, at 8 PM Eastern Time, on Chiller.